Vitamin B12 is a water-soluble vitamin that is stored in the liver. It is an especially important vitamin for maintaining healthy nerve cells and it aids in the production of DNA and RNA. Cell division and blood formation does not occur without Vitamin B-12. It is of special interest to vegetarians and vegans since it is not found in any significant amounts in plant foods. Deficiency of Vitamin B-12 is a serious health issue and should not be taken lightly. Vitamin B12 deficiency is a common cause of macrocytic anemia and has been implicated in a spectrum of neuropsychiatric disorders. Vitamin B12 is highly beneficial in various forms but DEVA Sublingual B-12 contains only one form: Methylcobalamin. Methylcobalamin, the coenzyme form of vitamin B12, is a body-friendly version, which means that no metabolic steps are required for its ingestion and it can be used it in its normal form. The product comes as a sublingual tablet that dissolves under the tongue so the vitamin B12 can directly penetrate the bloodstream and yield its benefits. Tablets are pleasant tasting and dissolve in a short amount of time – just put one under your tongue and you’ll get your daily need of B-12 without having to swallow any large pills or take any yucky powders to get what your body needs. Each bottle contains 90 tablets, which is a 3-month supply. Available in a standard strength of 1000mg for $7.99, and an high potency strength of 2500mg for $9.99. From Chery of California, California on 9/17/2014 . I did not realize these had added Folic Acid or I would not have purchased them. According to important research by prominent Vegan doctors supplemental Folic Acid is detrimental rather than beneficial to our health. The title nor description mentions Folic Acid but I see it now written small in the photo and lower down in the description where it has % of daily value. From Nelly of Guadalajara, Mexico on 9/6/2014 . Small & delicious flavor! So simple to stay away for a deficit risk. From Anonymous of leander, Texas on 1/25/2012 . i would just like to say that my b12 issues came rather abrupt and in a not so nice way, being a vegan for about 3 years i had heard so many different views on whether or not vegans have to take b12. So of course I did not take it and suddenly became extremely tired and was having a hard time even getting up out of chair and was seriously thinking about a b12 definciency i decided to take this and wow! instant energy in the first pill and by the way they have a very pleasant taste too. From Anonymous of Canada, Alberta on 3/27/2010 . 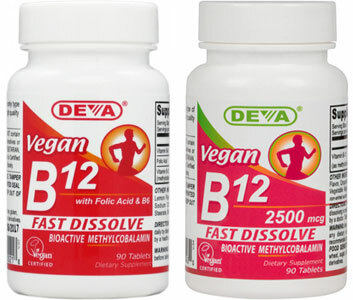 DEVA B12 is good because it uses methylcobalamin. Some other B12 supplements use cyanocobalamin. Methylcobalamin is better because it is natural. Cyanocobalamin is synthetic and when your body breaks it down to methylcobalamin and adenosylcobalamin, it produces a minimal amount of cyanide. From Christina of Phoenix, Arizona on 11/2/2009 .